Invented this a couple of weeks ago. Based on a pisco sour, I used blood orange for the sweet and left out the bitters. Delicious! 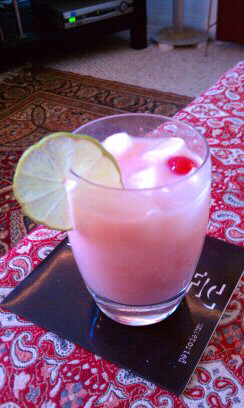 Garnished with a lime wheel and a cherry, it looks quite pretty. The name was just a convenient way to make fun of a rather sensitive buddy of mine. He still refuses to try one. While I was playing with the blood oranges and since I ran out of limes, I came up with a Flaming Blood Orange Daiquiri using a healthy dose of 151. Very nice!